It’s been a very eventful week and I apologise for the lack of posts shared! For the first time in all my years of travelling I was mugged by thieves on a scooter (mini motorbike) in Amsterdam. They bumped me with the scooter and got hold of my handbag, wrenching it from my grasp as they sped away. Apparently they also steal headphones in a similar way, pulling them off people’s heads as they drive past. This sounds much more painful than what I experienced! My reason for sharing is to encourage dialogue. I’m told by the police that this is a relatively new modus operandi but it is becoming absolutely rampant in Europe. The more people know about it, the less thieves will be successful. I’m so grateful to everyone who has supported and encouraged me over the last few days. I really have been blessed by so much kindness. But back to the Hop! It’s always hard to choose features from the wonderful posts that are shared. This week I was seduced by three cakes – one nutty and two fruity! Oh, April I’m sorry about your purse. It’s bad enough to have it stolen, but for it to happen while travelling is even worse. Hope things are getting back to normal for you. Thank you so much, Michelle. It’s been really disruptive and we’ve had to change some things around but hopefully things are starting to come together 🙂 Thank you for being a part of Hearth and Soul! The strawberry rhubarb upside down cake sounds tempting! As long as you stay safe and sound, that is most important. My hb and I also had terrible similar encounters in Amsterdam. No kidding. I cannot exactly remember what had happened as it was many years ago. It was like a pair who faked themselves as police, stopped us in some alley, asked to see our passport/identity and ask if we carried foreign currency/cash in our wallet. When they realized there was none, we were “spared”. It is not as mild as I have described here but that really left me a really bad impression of Amsterdam, and it was really a terrifying encounter. Was just glad we came out of that trip, alive. I’m so sorry you had a bad experience as well. I have been hearing quite a few scary things about Amsterdam since I got back. 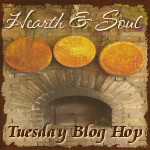 Thank you for being a part of Hearth and Soul. Oh, April, I’m so sorry that happened to you. My ex and I got robbed at Naples railway station several years ago, and I know what an awful and unnerving experience it is to robbed in a foreign country. I was mugged in NYC years ago… it is a horrible thing to go through. You feel so violated. I’m so glad you didn’t get physically hurt. Take care. Thank you, Diane, and thank you for being a part of Hearth and Soul. It’s my first time at your hop and I posted an article about kids cereals (not a recipe). I hope that’s ok. See ya next week! Hi Sara and welcome! Your article is great, thank you. I look forward to reading it. April and crew…thanks for hosting a hop dedicated to real food. Have a great week! Thank you for joining us, Lisa. Hope you have a great week too! Hope you’re feeling a little happier now!! The exact same thing happened to my eldest near his home in London. Once he had replaced everything exactly as it was, he was able to get over it. My father was walking in Amsterdam on the first day of his holiday and someone came up with a “ghetto blaster” and swiped it across his face – he looked dreadful. Fortunately he wasn’t too badly hurt (he was in his 70s though). Hence – I’m not going there – ever! Oh my goodness your poor eldest and especially your poor Dad! I’m so sorry to hear those things happened, Vicky! I’m not planning on going back to Amsterdam ever again either, that is for sure. I’m slowly feeling a bit better although I’m desperate for my new passport to arrive as we have travel plans. Take care and thank you for being a part of Hearth and Soul! Ugh! That must have been terrible! I’m glad you’re okay, though! First of all, I’m glad you are OK but I’m sorry to hear about your experience in Amsterdam. Those types of things can really sour a vacation. I hope you were able to enjoy what was left of your time there. Thank you, Mireya. Unfortunately the rest of the time there was taken up with trying to get travel documents so I could return home and sorting everything else out. But all is well now. It certainly was an experience! Thank you so much for being a part of the Hearth and Soul hop.